On certain occasions, we have a vertical and dividing element which resistance to fire needs to be increased by one of its sides, either because of a fire sector change or because of an adaptation to the current regulations. In these cases we must study the support work and depending on what we have, we will use some of the different solutions designed and tested by our R & D department. Many times we find divisors between two neighbors made with concrete block sup to 3 m high and from there up closed with sheet. This last element does not meet fire resistance and must be endowed with the fire resistance required in the table above. It is done only in one direction because when the activity license project is done, its purpose is to prevent a fire to pass from your facility to the neighbor’s, and not the other way around. 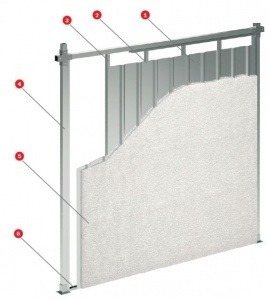 a) Firewalls Linings EI-120 with 70 mm channel/stud structure, 70 mm thick Rock Wool and 100 Kg/m3 density and two 15 mm Tecbor A Silicate and Magnesite Panel plates.